A masonry mass, pier, or solid part of a wall that takes the lateral thrust of an arch. A surface or mass provided to withstand thrust; for example, end supports of an arch or a bridge. In a coal mine, the place where the natural ground material makes contact with the ends of an embankment. 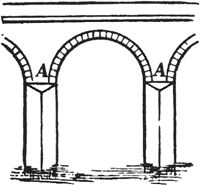 A masonry mass (or the like) which receives the thrust of an arch, vault, or strut.